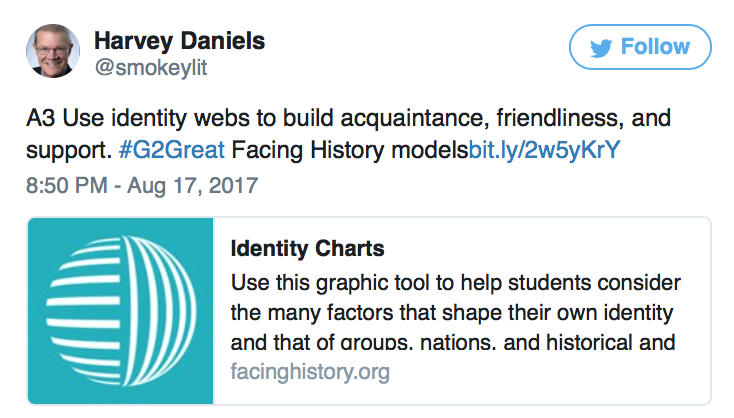 On August 17, 2017 Harvey “Smokey” Daniels joined #G2Great to lead us in a discussion about fostering curiosity through student directed inquiry. We gathered around the #G2Great table and were inspired by Harvey “Smokey” Daniels as he engaged us in so many possibilities around creating a curious classroom. Curiosity – “Wait, what?” Often we hear this question from our students and we shrug it off – almost thinking they were not listening when they utter those words. If we think about why someone says, “Wait, what?” it is the first sign that they are curious about whatever it is they heard. Something caused them to pause and say, “wait, what?” they inherently in that question want to know more. When we hear kids say this we should embrace it and push them deeper into inquiry. Kids should jot down, at that very moment exactly what it was that caused them to say, “Wait, what?” Schools should be a place where students leave more curious, wanting to go out into the world and learn more. Inquiry breeds curiosity and promotes effort, developing the habits of mind we want for all of our students. Choice – “Choice matters!” Any of us, adult or children thinkers, writers, and readers just think better when we have a choice about what we are thinking about. We are more motivated to dig deeper and invest more time in topics that we can choose. How do we support the development of lifelong thinkers, readers, and writers? We encourage them to think about, read about and write about topics that matter to them, topics that they are curious to learn more about. Community – Curiosity and choice go hand in hand with thinking amongst a community. When we embrace curiosity we begin to model and support an environment that functions as a safe community. Students who engage in inquiry, are best supported and encouraged in a community where collaboration and team work is valued. Students who work together learn how to mutually respect and support others and their ideas. 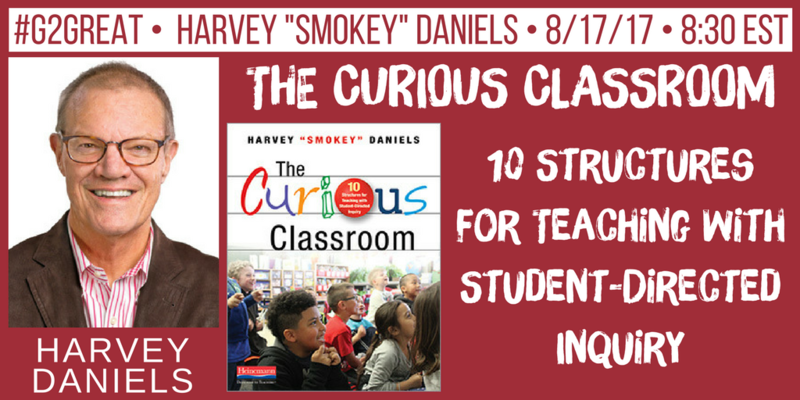 If you want to learn more about The Curious Classroom check out Harvey “Smokey” Daniels’ book! If you are interested in hearing Harvey “Smokey” Daniels share more ideas you can listen to a podcast on the Heinemann website.